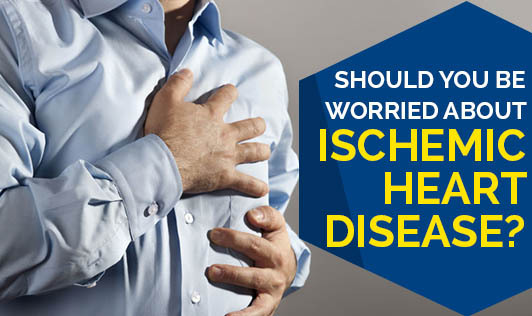 Should You Be Worried About Ischemic Heart Disease? Ischemic Heart Disease (IHD) refers to reduced blood supply to the heart due to coronary artery disease (clogging of arteries that supply blood to the heart). Symptoms include angina (tightness or heavy pressure or crushing pain in the chest when a person exerts himself), shortness of breath and unable to exercise much. The pain might extend to the neck, jaw, shoulder or arm. A cardiologist can best diagnose IHD and treat it appropriately. Risk factors that enhance chances of IHD are - family history, age, gender, diabetes, high blood pressure, high blood lipids, excess weight, bad diet, lack of exercise and smoking. Prevention of IHD would include eating healthily, exercising regularly, maintaining desirable body weight, avoiding tobacco, and controlling diabetes/ blood pressure/ blood lipids. Do not neglect cardiac symptoms if you have any. Get help from a doctor at the earliest.